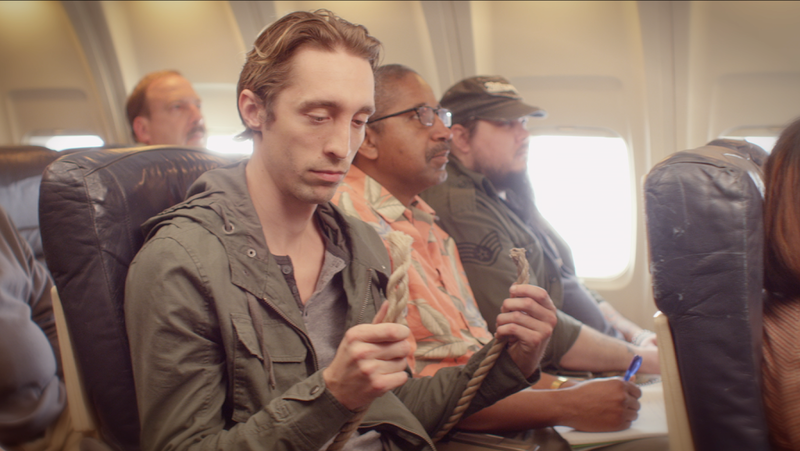 I recently shot a spec commercial that was picked up by Virgin Airlines. It was shot on RED EPIC with super speed MKII lenses. I was excited about shooting this piece because it involved shooting inside an airplane. 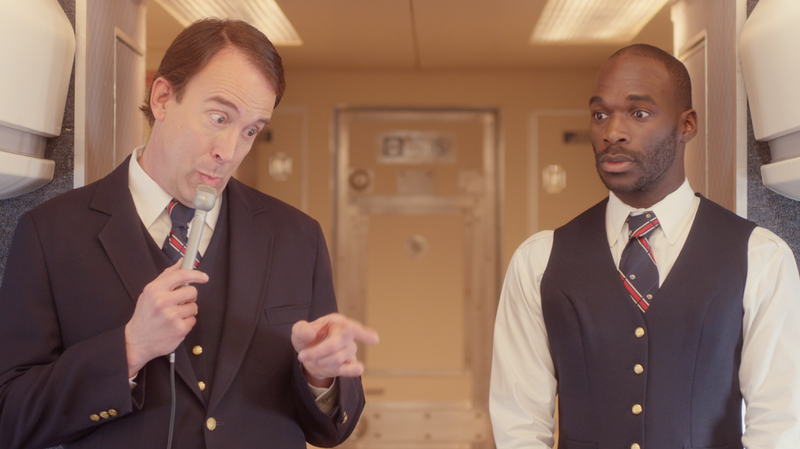 I knew the biggest challenge would be space constraints as the plane interior that we shot in was to scale. 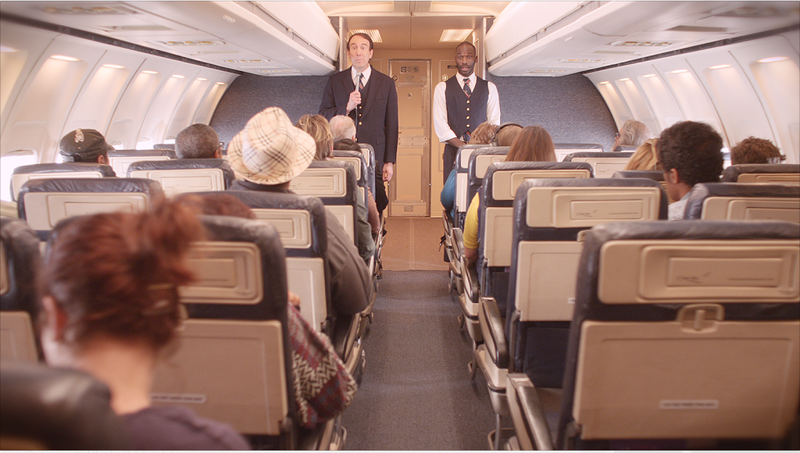 I watched a bunch of movies that had scenes that took place inside an airplane to gather some lighting ideas. One challenge with our particular plane was that due to time constraints we could not remove the roof, which was only about 6″ above the talent’s heads. I had some experience working with VHO PRO LED LiteRibbon before and I loved how low profile they were while still having a fairly strong output. I ran two strips of LiteRibbon down the length of the isle’s ceiling, one on each side so that it created an even top light all the way through. You can dial in the brightness as well as the Kelvin on the LiteRibbon so it’s very controllable. We gelled the windows on both sides of the plane with 216 and punched 1.2 HMI’s through both sides. This helped raise the ambience inside the plane and mixed with the top light from the LiteRibbon so that the source felt more even rather than all the light originating from above. This filled in the talent’s eyes/faces nicely. The HMI’s also created a nice back/edge light for all the passengers. I shot around a F2.0 with the super speeds which I’ve found is a great stop on those lenses. Once you start opening wider than that the image becomes too soft in my opinion. At a F2.0, it just starts to feel a bit softer and milk slightly as opposed to being closed down more. I think an F2.0 is a nice happy medium for super speeds, not too soft/milky but just a touch. The highlights also bloom nicely which looked great on the 216 gels over the windows. It was also nice that the HMI’s played a bit cooler than the existing practicals in the plane as it created depth with a variance in color temperature. Setting the EPIC at 5600 white balance, I dialed the Lite Ribbon in to a bit warmer than 5600k so that the faces read slightly warm but closer to white while the background elements that were lit from existing practicals read warmer on camera. A 4′ slider ended up working out great to add some movement to shots without being too cumbersome due to space constraints. One of my favorite shots in the piece is the opening shot that slides forward down the isle, it’s on a wide lens (18mm) and has a lot of depth, symmetry and interesting lines with the curvature of the airplane (TOP LEFT) We did have to remove some of the seating on one side in order to get slider shots of passengers etc. Overall I think the spot turned out great, it was exciting that Virgin liked it enough to pick it up, which rarely happens with specs. I’m glad I chose to go with the LiteRibbon, really amazing tool that I will definitely be using again.